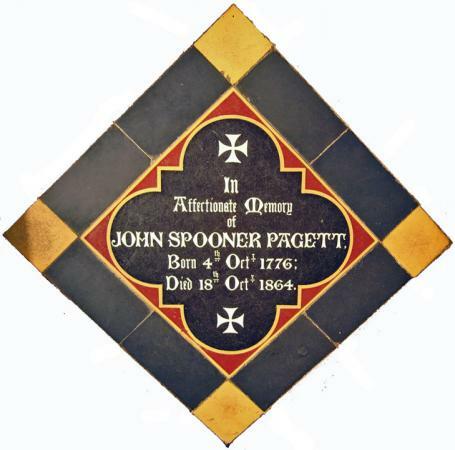 The son of Thomas and Ann Pagett, John Spooner was baptised in Rothley Parish Church. He owned land in Rothley, Newtown Linford & Markfield, and is variously described as a Farmer and Grazier. At one time he did duty as one of Rothley's Overseers of the Poor. He married the Mary of the next tile in 1847. Mary Walton was a Groby girl. In 1871 after John Spooner's death she and her two daughters, Mary Ann (born 1849), and Dinah (1851) shared a home in Town Green. Dinah married Edward Frost in 1877, moving to Leicester, and Mary Ann remained unmarried. This is the signature tile for the whole installation in the south aisle. It gives the year, tying in with the dedication in the new window above by Ann Grieve, formerly a Rothley Pagett. 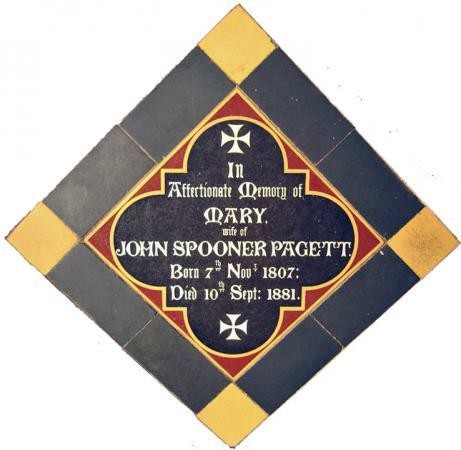 The unmarried Mary Ann must have inherited some of the family money coming down through her father John Spooner Pagett because she lived on until 1929 in Vine Cottage, Mountsorrel Lane "on her own means". 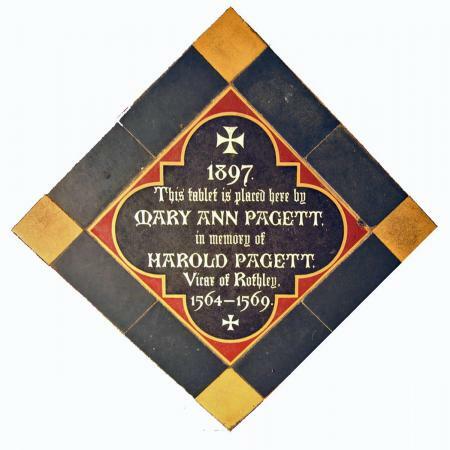 Clearly very proud to name a Pagett as a former Vicar. XHTML 1.0 validated. WCAG compliant. Page generated in 0.1297 seconds.